Tall hiking boots. Comfortable out of the box with no need for breaking in, but they are not as tough as they should be. 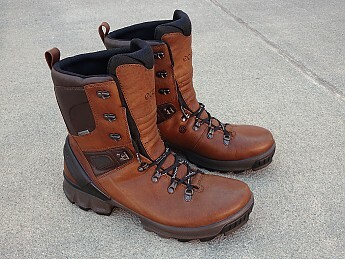 Danish footwear manufacturer Ecco makes its Biom Hike boots in two shaft lengths. It uses the same brand name for both, which can be confusing. Amazon UK adds to the confusion by describing the tall variant as "low trekking and walking shoes". 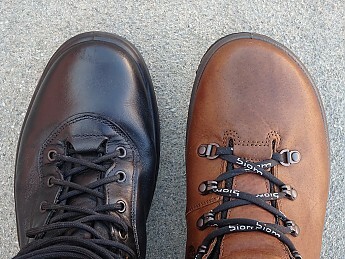 In the US the picture is clearer because the mid and tall variants are known as the Biom Hike 1.6 and 1.7 respectively. I am using US terminology in this review. 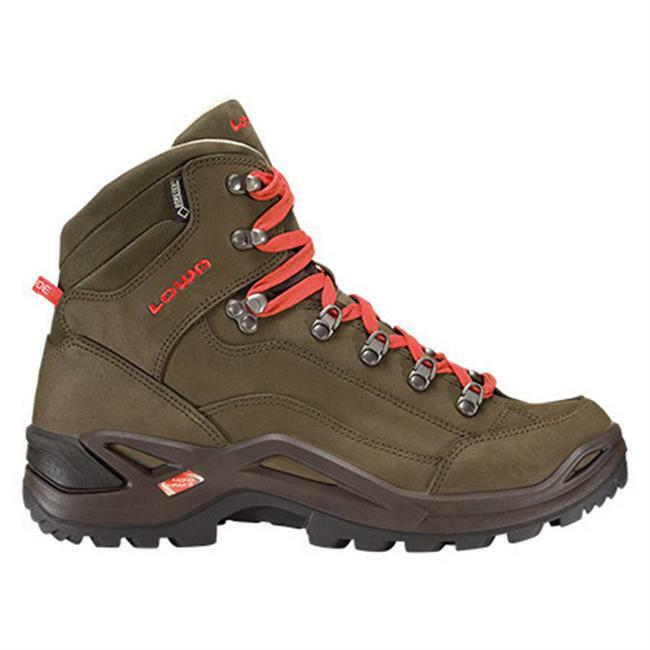 As I explained in my review of the Lowa Uplander GTX boots, I’ve come to prefer tall boots for hiking in wet conditions because the extra height offers more protection against water getting in over the top. 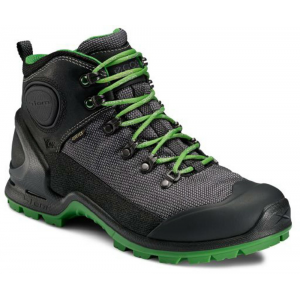 The Uplanders are my go-to boots for wet conditions, but I’ve had my eye on the Biom Hike 1.7s as their eventual replacement. The Biom Hikes have a better lacing system than the Uplanders, with proper locking eyelets at the ankle and open hooks on the shaft. The Hikes have bigger, more widely spaced lugs on their outsoles, promising better grip on soft ground. The one factor that put me off the Biom Hike 1.7 was the price—an eye-watering £240 (currently US $326). But prices on Amazon can change suddenly, and one day I discovered that the boots in my preferred size and colour were available at £124 ($169)—virtually half-price. Just hours later they were back to full price, but not before I had given in to the temptation and ordered a pair. I have tried the Biom Hikes on my feet and I have tested the waterproofing. But I will only start using them regularly when my Lowa Uplanders wear out, and those have plenty of life left in them. So in this review I can only present my first impressions of the Biom Hikes. I am doing the review anyway because information about the Biom Hike 1.7 is thin on the ground, and a preliminary review is better than no review at all. The forefoot on the Biom Hike tapers inwards, meaning that the big toe has the most space ahead of it. 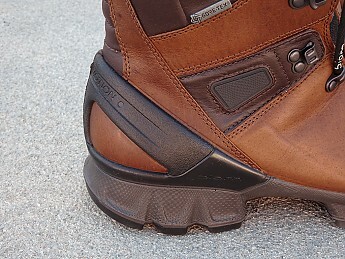 Most other boots taper towards the middle, meaning that the second toe has the most room. My second toe protrudes ahead of my big toe, so I worried that the shape of the Biom Hike might cause me blisters. I therefore gambled by going a size up. Normally I wear hiking boots in size 45 (US size 11.5), but I ordered my Biom Hike 1.7s in size 46 (US size 12/12.5). The gamble has worked. 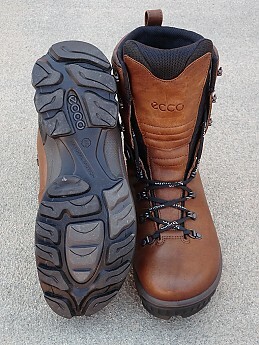 Ecco boots tend to be shallower in the forefoot than other makes. This, coupled with a well-contoured heel cup, means that my size 46 Biom Hikes hold my feet at least as securely as my size 45 Uplanders. 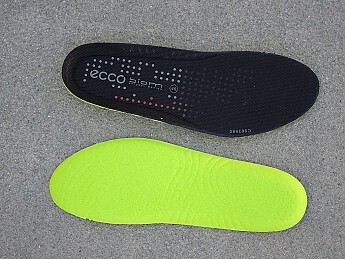 Before comparing the two I inserted thin volume reducers under the insoles of my Biom Hikes. But I have a pair of high-volume Superfeet Orange insoles in my Uplanders, so if anything the comparison was skewed in favour of the Uplanders. The leather uppers of the Biom Hike 1.7 feel supple and flex easily with the foot. This includes both the forefoot and the shaft—the two places where boots usually need breaking in. To really test the shaft for flexibility I would need to walk on a slope, which I have not done in these boots. But I'm sure any stiffness that might be felt on a slope would quickly work itself off. The sole offers enough rigidity to protect your foot when you step on pebbles and pointed rocks, yet it flexes readily at the forefoot. At the same time the midsole is soft and springy, providing plenty of shock absorption. All this results in an excellent level of comfort. 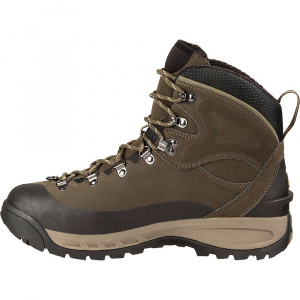 The Biom Hike 1.7s feel like the Rolls-Royces of hiking boots. They aren’t lightweights—each boot in size 46 weighs 823g or 1lb 13oz, compared to 775g (1lb 11oz) for a size 45 Uplander—but thanks to their comfort they don’t feel heavy on the feet. The lugs on the outsole are a little more pliable than one would expect. 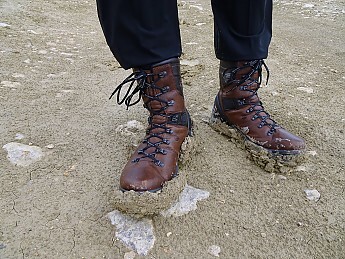 As I said I haven’t tried these boots out on rough ground, but my feeling is that they will offer plenty of bite on soft or wet ground. The downside of the lug softness is that the outsole might wear out quicker than average. 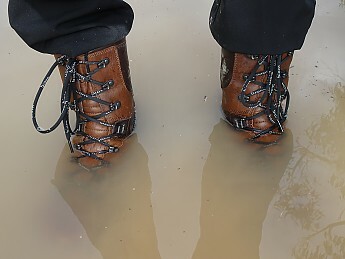 To test the waterproofing I stood the boots in some four inches of water for at least five minutes with the insoles removed. The boots remained bone dry inside. 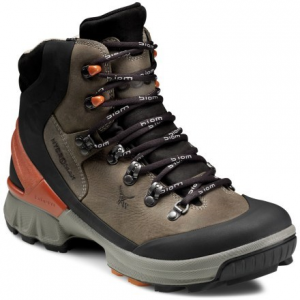 In most waterproof boots the tongue is joined to the shaft by means of a bellows extension and the Gore-tex or other waterproof lining goes all the way round. 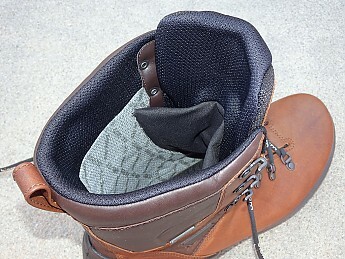 In the Biom Hikes the tongue is connected to the shaft only by means of a separate piece of waterproof material that is stitched to the Gore-tex lining. This stitching looks like a potential weak point in the waterproofing. On the other hand, my wife and I have owned several pairs of Ecco footwear between us and they have all been reliably waterproof, so hopefully Ecco knows what it’s doing. The other point of concern I have about these boots concerns the lack of a toe rand. 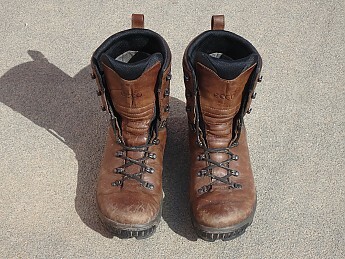 Hiking boots tend to take a beating in the toe area and a rand would offer valuable protection, particularly since the leather on these boots appears to be a little thinner than usual. On the other hand these boots are made of yak leather, which is supposed to be stronger and more abrasion-resistant than cow leather. All in all I'm very happy with these boots. When the time comes to retire my Uplanders I will do so with regret, but at the same time with eagerness to start using the Biom Hikes. I know I said I wouldn’t start using the Ecco Biom Hikes regularly till I retired my Lowa Uplanders, but I decided I wanted to try them out a bit more extensively before storing them away. 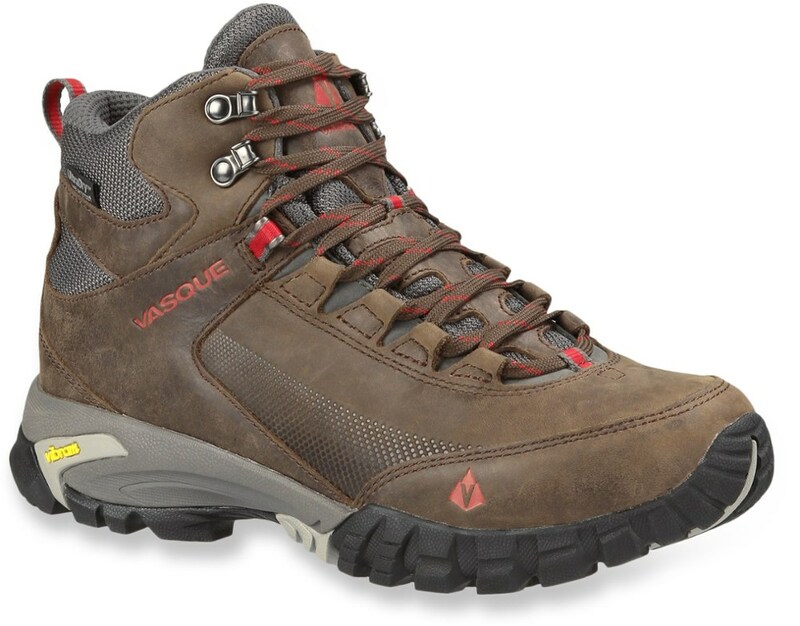 And so I’ve worn them on urban walks and on a few longish (6 to 7 mile) hikes in rough terrain. I’ve experimented with Superfeet Orange insoles, same as the ones I use in my Lowa Uplanders. 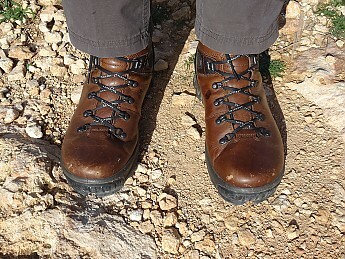 They improved the fit of the Biom Hikes, but two-hour walks left the soles of my feet feeling sore. My feet were never this sore when I wore Superfeet in my Uplanders, even after eight days walking the West Highland Way in Scotland last May. I have got the impression, from a comparison of both boot models, that the Biom Hike has a slight curvature to its footbed whereas the Uplander is flat. Perhaps this curvature accentuates the high heel arch of the Superfeet insole to the point where it becomes a liability to the foot (or at least to my foot). Whatever the case, I decided I wouldn’t use Superfeet in the Biom Hikes, so I went back to the original Ecco insoles with thin flexible inserts beneath them as volume reducers. This arrangement is comfortable, but I have had to get the hang of tying the laces. I find that with every new pair of boots you wear, you have to learn how tight to tie the laces, and when you start walking you might need to readjust them. But the test of any pair of hiking boots is whether you forget about the lacing eventually, and the Biom Hikes have passed this test. Once you get the lacing right the boots feel comfortable indeed. They protect your soles and ankles, but they feel as supple on your feet as gloves on your hands. I can confirm that they do not need breaking in: the shaft flexes easily with the foot even on steep inclines. I’ve worn the Biom Hikes in rain and mud and I’ve taken them through water inches deep. The waterproofing has held up perfectly so far. The outsole has excellent grip on all kinds of surfaces, including wet rock slabs of the sort on which I wouldn’t trust my Uplanders. On a muddy surface, with a strong wind blowing, I found my footing precarious, but what boots offer secure footing in mud? As soon as I got off the mud my Biom Hikes reverted to their usual solid grip even though they were still caked with the stuff. And the outsoles with their big flexible lugs shed the mud quickly as I walked on. The downside to these boots is that they are somewhat delicate. 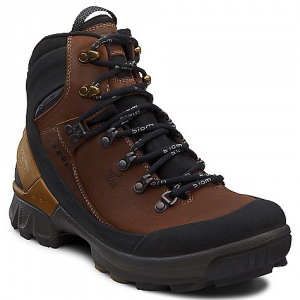 Yak leather is supposed to be resistant to abrasion, but these boots scuff quickly. They were left looking somewhat the worse for wear after a single hike, admittedly on very rough rocky ground. I was able to restore their appearance with leather conditioner, but conditioner can’t fix abrasion damage. It’s a point of concern that this leather damages so easily, given that it is rather thin to begin with. The outsoles of these boots are also delicate. 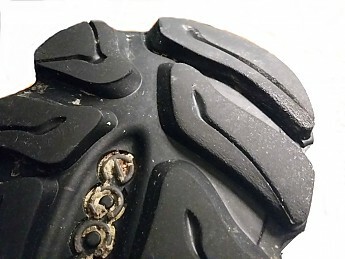 I can’t have walked more than fifty miles in the boots yet the heel lugs are already showing significant wear. Admittedly, a good part of these fifty miles were on paved surfaces, and hiking boots are not made for paved surfaces. But still, it’s significant wear for such a short distance. Flexible lugs offer excellent grip but the flipside is that they wear away faster. Ecco’s global website describes the Biom Hike 1.7s as "premium quality hiking boots" that are "designed for challenging terrain". The boots ooze class in their design, build quality and comfort. But I'm not so sure of their suitability for challenging terrain. I still regard these boots as the eventual successors to my Uplanders, but I know I will need to be careful with them to make them last. Because of this I’m reducing my original rating from four and a half to four stars. For the full price of $326 you’d expect boots that can take a beating, so I’m glad I got these at half price. But I’m still glad I got them. I've put my Biom Hikes into service much earlier than expected. In May 2018 I went on a six-day walking expedition in Ireland. I wore the Hikes on this trip because my Lowa Uplanders had started to leak. The Biom Hikes served me well on this trip. The terrain was rough in places, and on day 5 it was extremely wet and boggy. With less grippy boots I would probably have taken a tumble or two. I went through numerous puddles that would have flooded mid-height boots, but the Biom Hikes kept my feet dry most of the time. Eventually even the Hikes were defeated—especially when I sank waist deep in the mud. Even so, the boots got less wet inside than one might expect and they dried out completely by the end of the following day's walk. Still, there were three negative points. Firstly, I could feel my feet sliding forward inside the boots during steep descents. This is probably the downside of buying a size larger for extra toe space. 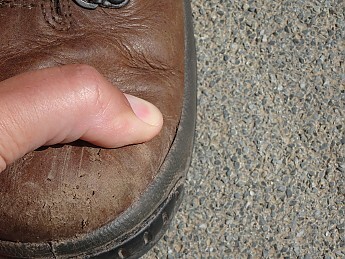 Secondly, the boots suffered a lot of abrasion in the toe area. They ended up looking like they had taken a real beating, as the photo below shows. In spite of these problems I am feeling upbeat about my Biom Hike 1.7s. I have been able to restore their appearance with leather conditioner and waterproofing wax. More importantly, the abrasion damage over the toes is not as bad as it looks. None of the scratches are so deep as to put the leather at risk of tearing. This is encouraging considering the roughness of the terrain I encountered. 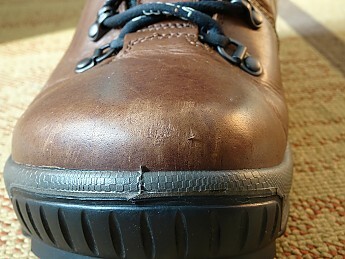 I have also fixed the gap in the right boot with McNett Freesole glue, and it seems to have made a strong bond. As long as the repair holds, and the boots remain waterproof, I should be able to use them on my next expedition in 2019. This would be a first because none of my previous boots (including my Lowa Uplanders) have lasted more than one expedition. So we’ll see. I will post an update in due course, assuming I haven’t bored everybody stiff with this long-running boot saga. Nice looking boots, Charles! Thanks for the initial info. I hope you'll keep us updated on how they work out, though I don't hope your Uplanders die on you. I'm not a hiking boot guy, but those are some good looking boots. Thanks for posting. Thanks for another update, Charles! The Ecco Biom Hike GTX 1.7 is not available from the stores we monitor.